Every now and then the Valley spews forth one of its own into the shark-infested seas of national notoriety. Usually the culprit is an artist, a musician or a novelist of some sort, though on rare occasion you might see the rise of a filmmaker like Ken Burns or a screen siren like Uma Thurman. 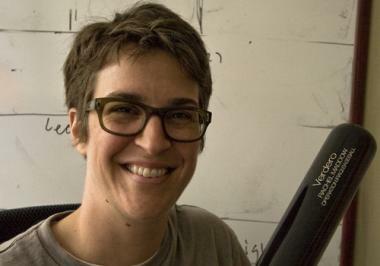 Dr. Rachel Maddow, a now-daily news presence on MSNBC who’s quickly becoming something of a torch-bearer for “the left,” saw a rather sudden rise to prominence from her humbler media origins in the Pioneer Valley, and still makes her home here (at least on weekends) with her partner, artist Susan Mikula. Dr. Maddow, never shy about offering opinions, generally packing the knowledge, education and awareness to back them up, accepted Smith College’s offer to be the commencement speaker for the class of 2010, an announcement which was received with considerable excitement by the graduates-to-be (you can watch their reaction at http://www.youtube.com/watch?v=dByVFc7ID20). She spent some time with the Valley Advocate talking about politics, education, media, social issues and life in general as a bi-located media star who’s still trying to adjust to life in the fast lane. Valley Advocate: You got your start in media here in the Valley, at WRNX and WRSI. How did you break into the big leagues and wind up on MSNBC? Rachel Maddow: Same story as everyone: I met the Devil at the crossroads of Bridge Road and King Street one night, and made a deal. Actually, I just got lucky tricking Air America into hiring me in 2004. Once there, I got lucky in landing a hosting gig on a show with Chuck D and Lizz Winstead. That resulted in me being asked to be a guest on cable fight-about-politics shows. After doing that for a few years, MSNBC decided to make me a paid contributor in January, 2008. Then a few months later, I got lucky again when Keith Olbermann asked me to sub for him when he was away for a few days. Then MSNBC asked me to host my own show, starting in September 2008. Also, there was the Devil thing. Air America just filed for bankruptcy, killing your radio show on that network along with many others. What happened with the network (other than one previous bankruptcy and losing Al Franken to the senate), and how do you feel about the whole ride? Air America made a good run of it for more than five years in a very challenging climate. The modern iteration of talk radio evolved as an almost entirely right wing phenomenon—Air America tried to change that, and did succeed in shaking up the format a bit. It also recognized and developed a lot of great progressive media talent who have gone on to a lot of other gigs. A lot of people look up to you as a sort of hero of the progressive movement, yet you come from a military family and seem to hold some views that aren’t necessarily considered “liberal.” Still, many conservatives stapled a scarlet “L” on you years ago and seem to have turned up their “blah-blah-I’m-not-listening” knob so it drowns out anything you might say that they might agree with. What do you make of this quasi-mythological status that’s been bestowed on you, and where would you say your views actually hunker down in the political spectrum? I’m not too much of an expert on what people think about me. It’s hard enough to quantify the general perception of anyone—I think it’s impossible to do it about yourself. That said, I’m undoubtedly a liberal, which means that I’m in almost total agreement with the Eisenhower-era Republican party platform. Our politics have drifted so far to the right now that, for example, no one believes there is a single, confirmable judicial nominee out there who is as liberal as the Supreme Court Justice he or she will replace—a Republican appointed by a Republican president in the ’70s. Justice Stevens didn’t become a liberal once he was on the Court—he maintained his moderate Republican-style views, while the Court (and the rest of our national politics) shifted so far to the right that he ended up on the Court’s far-left wing, simply by standing still. What do you make of the recent controversial Citizens United Supreme Court decision allowing unlimited corporate campaign contributions? I think it’s a disastrous decision that reverses almost every gain ever made by reformers against the rich and powerful buying our democratic process. It also indicates that the “conservative” majority on this Supreme Court is quite radical in its eagerness to reach well beyond the facts of a particular case to create policy. You still have a place here in Western Mass. How often do you get back to the Valley with such a busy Manhattan-based lifestyle? Every weekend, if I can. I get grumpy if I have to go more than a week without being here. Among the many hats you’ve sported, one has been that of a behind-the-scenes political analyst. Where do you see the Obama administration when the next presidential election rolls around? Two and a half years is a lifetime in politics. I’m bad at forecasting anyway, but I wouldn’t believe anyone who says they can tell you in early 2010 what’s going to happen in late 2012. I do believe, though, that legislative accomplishment is a better political barometer than most people think it is—the more Democrats are able to achieve with their majority, the longer they’ll be able to hold on to it. What do you think of the First Lady? No idea! She seems like an accomplished, smart person, and I really like her public speaking style—but I only know what I glean from her press coverage. Being First Lady is a strange job: there’s no single right way to do it, everyone thinks there’s a million wrong ways to do it. I don’t envy her the unblinking public scrutiny. Do you think the American health care system is fixable? Do you think that eventually it will start to resemble a more Canadian or European model? If it isn’t fixable, American business is going to be at a big structural disadvantage to our global competitors that will get worse every year. We have long-established single-payer and even nationalized sectors of our health system that do better than the private-insurance sector at providing care and managing costs and satisfying patients and health care providers. In policy terms, we’re dumb to not just build on them, but I understand the political reasons why we haven’t. You seem to have pretty well put the kibosh on rumors of you running against Scott Brown for Ted Kennedy’s old Senate seat. Was this ever actually a notion that crossed your mind, or just the hopeful speculation of some Massachusetts Democrats? No. It was all Scott Brown’s fundraising idea. Sigh. No. His office has never returned a call from my office, ever, on any matter. You recently hosted the two-hour documentary The McVeigh Tapes, which examines interviews with Timothy McVeigh, America’s most notorious domestic terrorist, before his execution. What inspired you to pursue this topic, and what have you gleaned from your research about the mindset and motivations of extremist anti-government sentiment? Do you think this sort of sentiment is on the rise again, and if so, what do you think should be done about it? Anti-government ire is nothing new. What is on the upswing again now, though, are threats to wage violent war against the government, to assassinate political figures, or to achieve political outcomes in America through violent intimidation. That was also true about the time in which Timothy McVeigh came back from the Gulf War and got radicalized on the gun show circuit, among the militias, and in the racism-tinged survivalist and anti-government movement of the early ’90s. I don’t believe that those movements today are populated with lots of McVeighs—but someone as unhinged as McVeigh somewhere in the country may be taking some of the rhetoric literally. I hope figures of authority respected by those movements will speak out about that risk. As a graduate of Stanford University and Oxford and recipient of a Rhodes scholarship, your academic career has been extensive and impressive. Obviously, this is one reason among many that you’ve been asked to speak at Smith’s commencement. Do you see higher education as an essential key to success? Everybody’s got to find their own path, and there are a lot of great ways for people to prep for careers. That said, I think that rigorous, classical liberal education is a form of intellectual training that helps in just about every career, and in life. The Enlightenment is a really handy inheritance for, you know, civilization—it’s worth deliberately learning its lessons. Would you be back in school had it not been for your fortuitous rise to the fourth estate’s punditocracy? No. Much as I dig what I learned in school, I never actually liked school itself. I envy people who do! Smith is giving you an honorary degree. One of the other women receiving one this weekend is Princess Basma Bint Talal of Jordan, whose biography paints her as a paragon of compassion and dedication to global issues like environmental protection, sustainable development, health and human rights (especially the welfare of women and children) and socio-economic justice. Have you hob-nobbed with royalty before? I know a lot of drag queens and drag kings. Does that count? What keeps you going on a day-to-day basis? Fear of failure. Ta-daa! I work very hard at what I do—both because I love it, and also because I think it’s difficult to do well, and I don’t want to screw it up. It makes for a life without much downtime in it—but one that’s very rewarding when things turn out. It also helps to be in love. I don’t have much else going on in my life besides work and my relationship with Susan and a small circle of friends and family—but those personal relationships are more important to me than anything. Susan’s the magnetic North in my life—I am thankful every single day of my life to have her. Have you seen the video of the student reaction to the announcement that you were going to be the speaker? Yes—it’s very flattering and very intimidating. I hope my speech is good enough to deserve that! What will your advice (other than “stay in school”) be to Smith graduates who are entering an anemic job market courtesy of the worst economic recession since the 1930s? I have been to a Smith graduation, with a girlfriend who graduated in 2000. When I heard you were the commencement speaker, the first thing I thought was, “I hope she doesn’t pull a Jodie Foster on them.” (Foster backed out of the 2000 commencement commitment, leaving the class of 2000 with a fairly depressing monologue by visual artist Judy Chicago. Mercifully, we were able to lighten things up by teaching a graduating student—whose native language was Russian—to sing Bon Jovi’s “Livin’ on a Prayer”). You’re not gonna let these gals down, are you? We’ve got to hold on to what we’ve got—doesn’t make a difference if we make it or not. We’ve got each other and that’s a lot!